After all the animal drawing for the different challenges on Twitter, old talent comes back. So is humor. The latest 4 drawings made me very happy and I had a lot of fun too. 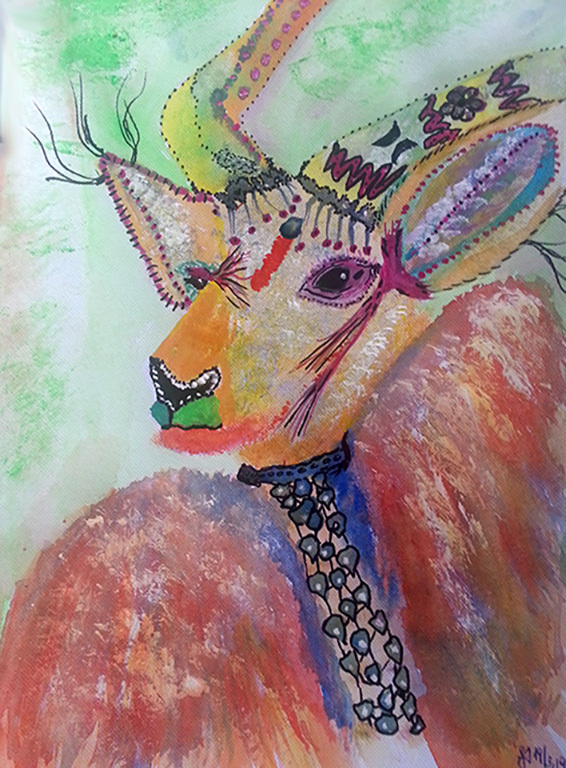 After the cormorant I tried to paint a Hippie Nyala as I saw one on Pinterest. Here is my Hippie Nyala looking good – living her hippie life in Africa. 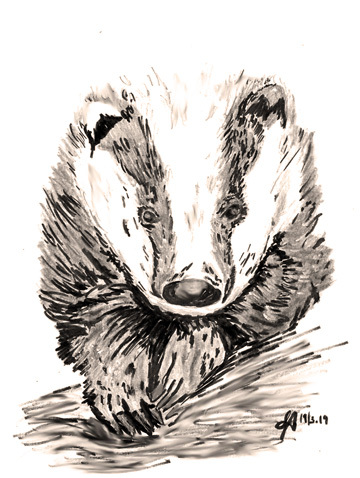 The next animal on the list a badger. Same thought – I can’t do it. Yesterday evening late there was the drive to try and here he is – my personal miracle No. 2. 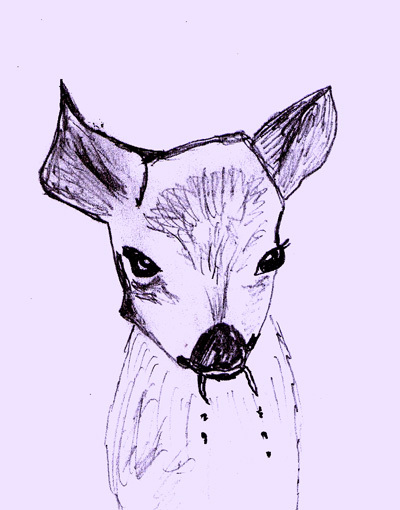 Because of the Hippie Nyala I suddenly wanted the deer to be fancy too. That was fun. 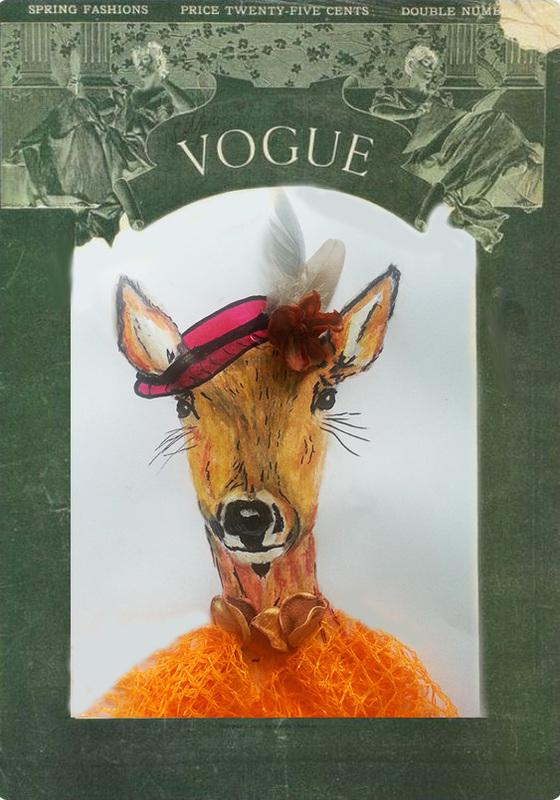 I even set her on an old Vogue Cover and made up her success story ON Twitter – meet HATTY. She is the elegant sister of Nyala. 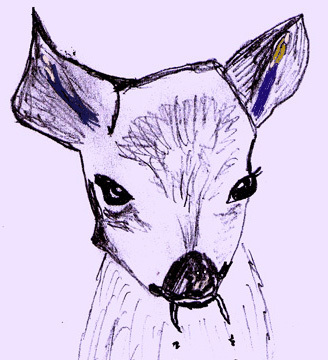 Suddenly I saw figures in the ears of the deer and a face n the nose – my fantasy …so I colored them. 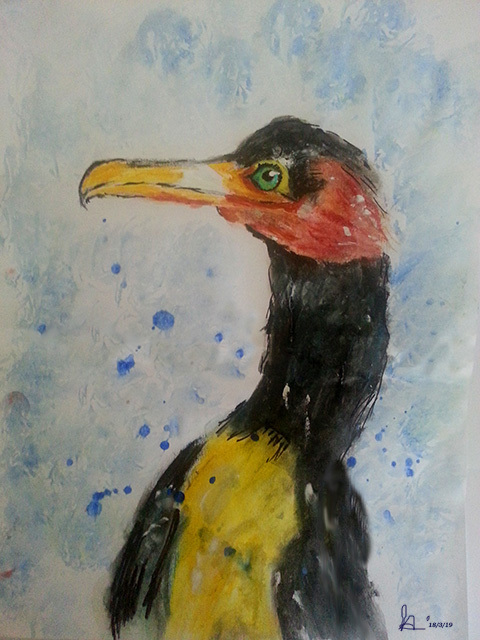 For #animalmarch of #kleineKunstklasse on Twitter the cormorant was listed for today. My first thought was that I never would succeed to paint the fellow. Trying after all and oh wonder within half an hour there the bird was on paper. Over the years I happened to notice that there must be an inner connection with my process or I cannot draw or paint of something or make a shaman tool.Therefore I went looking for the animal power of Cormorant. What I found actually is suiting my process very much as well as the full moon we have rising. The actual process I’m in got more clear when my friends came to visit last Sunday. They are clairaudient and clairvoyant. They looked at my last two paintings. The green one: there is a man standing with a sword yelling: everything has to go! The process of letting go the old -also crystal clear because of the edema – emotions, old feelings et cetera are water…. The cormorant dives into it to get what it needs. In human terms – info needed in the process to fly again like the cormorant after he dried. The other painting has the message: it’s complicated – the feeling I have indeed – it shows death and the girl but it’s complicated to see further then that. Maybe the Cormorant’s diving into my waters bring up info needed too. Today a new shapechallenge from @studioteabreak. 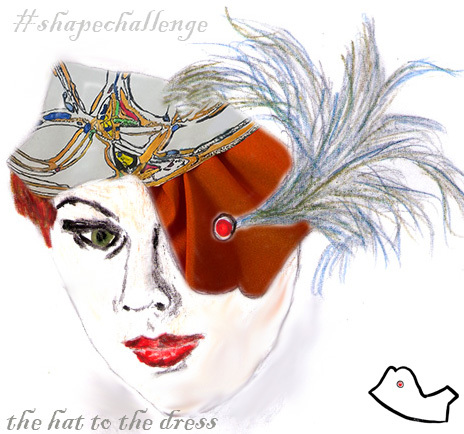 An easy one because in a flash I saw a hat suiting the dress in my previous blog. For a long time I’m dreaming to have my own clothing line. Designing wide cloths all made from natural material. There is @scribbleintoart #scribbleintoart on Twitter. Once a month you get a new challenge. The March scribble looked difficult at the first glance. After staring at it long enough, suddenly the idea. I want to make a dress out of it. Goodness but how? In the afternoon the idea came. I painted the scribble with gold and more. Had some fabric suiting around. 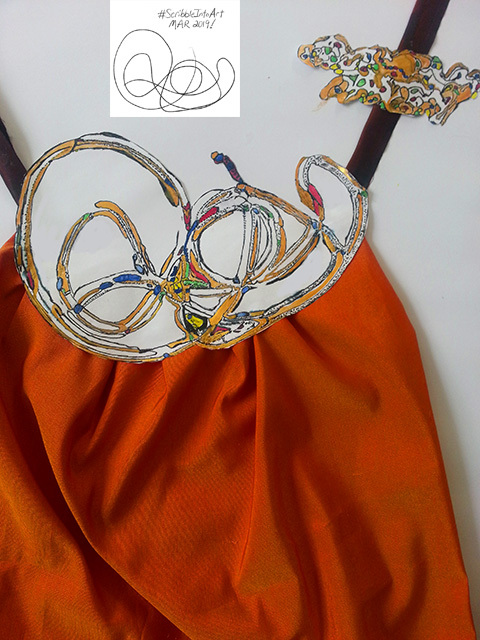 Put it together to a dress and painted a brooch. My 1st design is a fact. Would like to have it made for real. Under the hashtag # PortraitChallenge you find a portrait every Thursday to make your own version of. Here you see different versions of the latest portrait challenge. 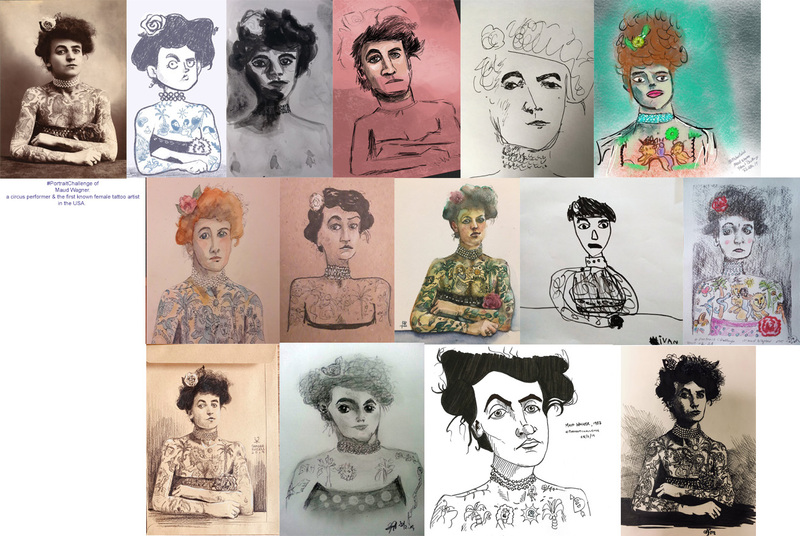 As you can see – everybody draw or painted the woman in his/her own way. 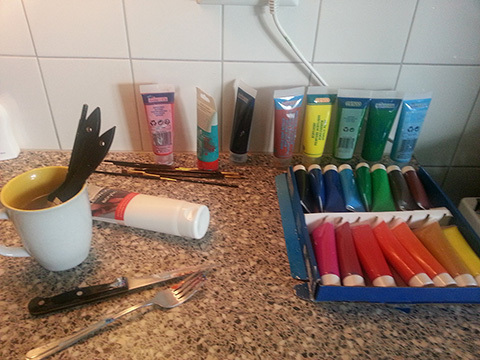 Not only the chosen material, paint, pencils and paper are different. The woman every time looks different. Some gave her a manly touch. Some made her old, some made her as if she was sad. Mostly done in black, some in color. It’s a great example of how we humans in general and artists in special, see someone. Most of the time we see only a part of a person. The part we see, often resembles a part of us because people are mirrors to each other. The work of artists always show us the artist him/herself too. What the artist show, be it music, dance, acting, writing, sculpturing and painting and more of the arts, is the way he/she is. Look all movies of an actor after another and you will see always the same mime, sort character. 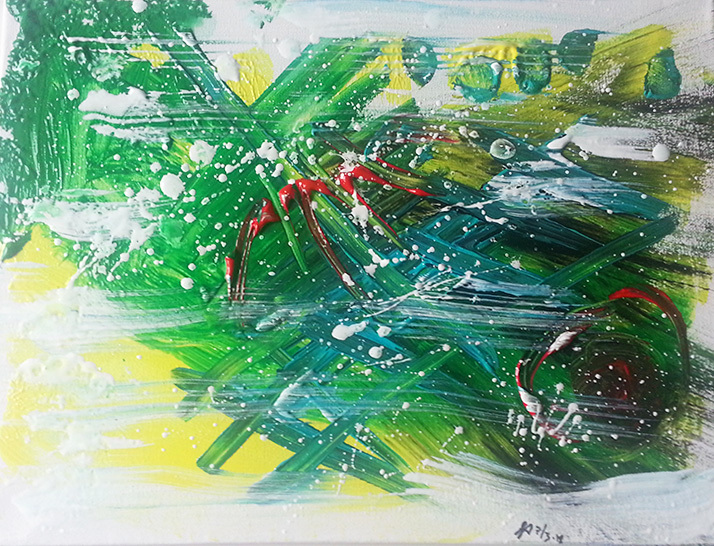 Themes of artists work show the artist as well. You can not see the light without refraction. 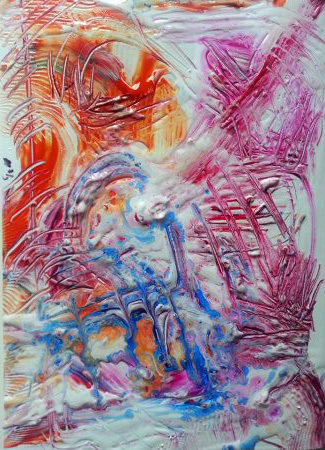 It can be white and divine, but you can only see it if it is broken and disintegrates into ‘colors’. Idem with life. You can only experience it in the ‘colorful events of it’. In short – expression through artistry. Art breaks through the limitations of daily life through colors with which you paint, dance how you move to music and why, words that can express a feeling. Another fantastic performance is reached when all the different arts play together. Artistry opens you to the world and often, at least I noticed that, artistry shows the future to come. 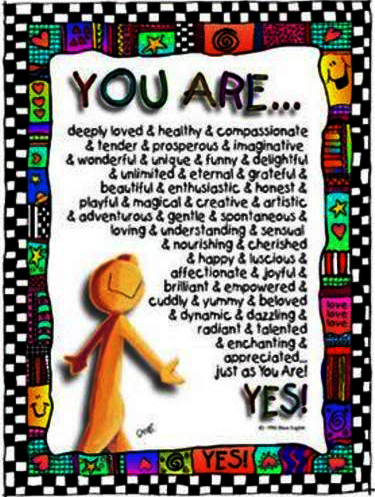 The named #hashtag on Twitter is a nice one to follow and join because you don’t need to be a star at the brush or pencil, you just have to be you.